To celebrate the 100th birthday of the National Park Service (NPS), REI is offering its members and customers a collection of limited-edition NPS-branded gear from a variety of outdoor brands. Commemorative products include packs, tents, trekking poles, hammocks, patches and T-shirt from REI, Osprey, CamelBak, ENO, Pendleton, Osprey and Coleman. A full list of gear celebrating the parks can be found online. “These products celebrate an amazing gift that was passed to us by previous generations – the heart of our outdoors, our treasured national parks,” says Susan Viscon, REI’s senior vice president of merchandising. 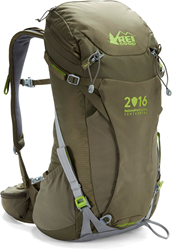 When customers purchase an REI-branded NPS-edition product, such as the REI NPS Traverse 28 Pack or an “America the Beautiful” Annual National Parks Pass through the co-op, REI will donate 10 percent of its 2016 proceeds from these items to the National Park Foundation (NPF), which is the official charity of America’s national parks. NPF raises private funds that directly aid, support, and enrich America’s more than 400 national parks and their programs. Other brands including Osprey, ENO and CamelBak have also pledged support to NPF. REI Adventures’ national park trips – The co-op is donating 10 percent of the retail price for each REI Adventures’ national park trip purchased through the end of 2016 to the NPF. With the broadest assortment of backpacking trips in the national parks of any active travel company, REI Adventures offers more than 45 national park trips. Last year, REI Adventures’ trips into these national treasures generated $300,000 in additional funding for the National Park Foundation. REI Outdoor School – More than 300 classes and outings are offered in national parks through REI Outdoor School. Participants can choose from a variety of outdoor activities across the country led by expert instructors and can look for special opportunities on fee-free days in the parks. National Parks app – The co-op launched a free dynamic, crowdsourced digital trail guide to the national parks called the REI Co-op Guide to the National Parks. Available on Android and iOS.